NAMM 2011 PRESS RELEASE: Back in 1986, Slayer released their landmark album Reign In Blood that helped shape the sound of metal for decades to come. 25 years later, it's high time to give that album the credit it's due, and ESP is doing just that with the limited-edition Slayer-2011 guitar. 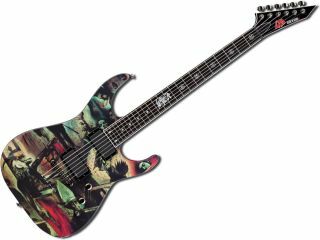 Limited to just 250 guitars worldwide, the LTD Slayer-2011 is highlighted with a custom graphic finish that employs elements of the cover artwork from the Reign In Blood album. Details include a special LTD headstock logo in Slayer's distinctive typeface, pentagram-shaped neck inlays, and the Slayer logo inlaid near the 12th fret. The guitar uses bolt-on construction, an alder body, a maple neck with rosewood fingerboard, 24 XJ frets, a TOM bridge with string-thru-body design, and EMG 81 (bridge) and EMG 85 (neck) active pickups.